The Spokane City Council Wednesday interviewed the five finalists to fill the District 3 seat vacated by Steve Salvatori in July. See their stances on some of the issues facing the city below. After the interviews, current councilmembers were reluctant to name favorites, though Mike Fagan said he may be leaning toward Karen Stratton, a current city clerk, or Adrian Dominguez, a Spokane Regional Health District epidemiologist, because they emphasized serving citizens in their responses. The full council will vote Aug. 25 (postponed from August 18) on their final choice. Meanwhile, applicant Kelly Cruz, who was not selected by any of the councilmembers to be interviewed, has filed an ethics complaint about the selection process. Cruz says he was given the wrong application form to fill out, but was not notified by the clerk's office until two weeks later. Because Stratton, a clerk's office employee, was a finalist for the position, Cruz claims an "appearance of impropriety." 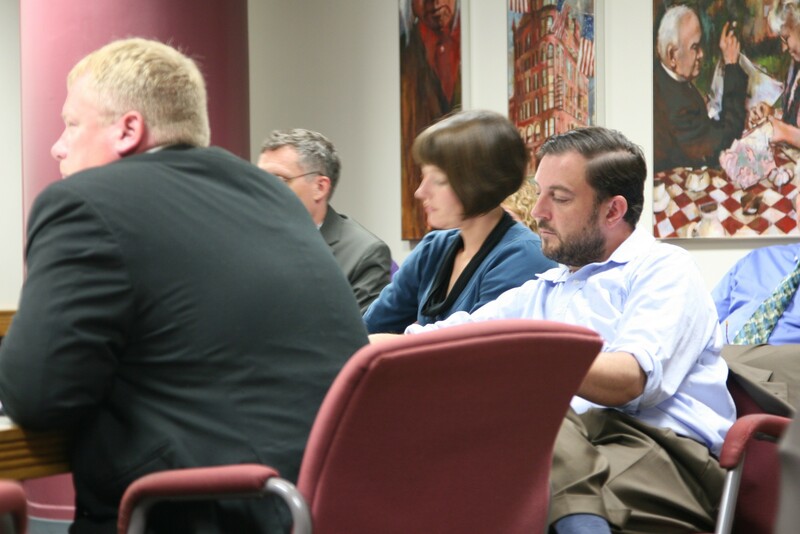 Read his letter to the city ethics committee here. The interviewees: Adrian Dominguez, Julie Griffith, E.J. Iannelli, Kitty Klitzke, Karen Stratton. Read more about each and see their full résumés and which councilmembers selected them as finalists here. The questions: The council asked each of the applicants the same questions. First, how much time would they willing to devote to the job and in which boards and commissions were they interested? Nearly all of the finalists said they would devote as much time as needed to the position and were interested in many of the city's boards and commissions, including transit, public safety and parks. What is your position on the expansion of the Urban Growth Area? Dominguez: "I'm all for Spokane growing. My concern is outside the city limits. I think we have to expand in a strategic way and I think we have to really be smart about that. The concern I have is that when you're outside city boundaries you take away some of those resources that the city provides. My concern is, when you look at the utilities that are going to be provided to the growth outside the city limits, who's paying for that and how's that going to impact those individuals that reside presently in the city? A lot of times I find from the work I do studying populations that the populations most impacted by this are those populations that are marginalized, those populations that have a difficult time as it is trying to just make ends meet. Some of those populations, communities, neighborhoods are in my district." Griffith: "We definitely have a challenge as a city to work with the county with the expansion of the urban area. I'm not 100 percent sold that you just expand willy nilly without a lot of thought to it, especially given the city structure and having to support that growth … At times I think we're gonna have to hold back and not support that growth unless we're ready." Iannelli: "I would not advocate expanding the UGA unless absolutely necessary. ... I'm aware that development has to happen, but to do so … we need to develop a strong infill strategy. Right now the UGA is affecting outlying neighborhoods, like Southgate, like Five Mile, and what needs to happen is we need to come up with a clear infill strategy that might involve developer incentives, for example, but is very much in keeping with neighborhoods characters, so a smart and tasteful infill strategy and certainly one that addresses business corridors." Klitzke: "One thing that can be very expensive and hurtful to communities, especially city centers, is expanding your infrastructure beyond what you can really afford to maintain and also expanding your infrastructure into new areas and focusing on those new areas to the detriment of existing neighborhoods and existing centers. … The simplest way to explain my view is that unnecessary sprawl and expansions of infrastructure hurt city centers. I think we need to focus our growth inside our existing areas that already have the urban services that they need and already have a lot of vacant buildings and lots that we really need to fill before we think about expanding out." Stratton: "I think that the biggest issue that I see with urban growth and the planning areas is the cost. While it's good to keep an eye on the sprawl and to protect your farm lands and to have some kind of structure to work with, when you start working or discussions take you outside of those there's always the question of who's going to pay for the services to those areas that are being developed. I was relieved to see, I guess at some point, that the mayor said there's a moratorium and we're going to take some time and talk about this and see if the city and the county can't come together." Do you support the current location of the Spokane Transit Authority Plaza and would you consider supporting a sales tax increase to fund STA's "Moving Forward" plan, including a central city line? Dominguez: "Again, it's looking at that data and making sense of that information. We can't just misplace individuals without having some type of either program or plan in place on how we're going to handle these individuals. ... If we are to move that area, what are we going to do with those individuals hanging out? The location itself is a strategic location downtown because people who come into the city are able to walk ... That is something I think that is beneficial to the city and to the health of the community ... I'm not going give you an answer and say yeah, do I support [a tax increase] or not. I need to know how that is going to ultimately impact the city and I would have to look at data." Griffith: "I know there's been some real challenges at the STA plaza that need to be overcome. I think it's become a bit of a blight issue in the downtown area especially considering the surrounding businesses and I totally understand that, so there needs to be some solutions in place to deal with that … My initial gut reaction is, no, not to move it because it will ultimately cost the taxpayers more money… What would the [tax] increase be would be my first initial question: Is it going to the taxpayers? Are they ultimately going to decide on that tax increase? I do believe that you do have to ask the taxpayers when you're going to have a tax increase … I do think they should have the choice to support STA." Iannelli: "Yes to both. I've lived abroad and I've seen the role that public transit plays in cities across the United States, on both coasts, as well as in England and in Germany … I've actually lived on the ground in these countries so I can appreciate as an average citizen the role that public transit plays and what [role] a strong central public transit hub … can play to strengthen a business community and a downtown. ... In the long term, I think it would be very detrimental to move the STA plaza. I'm aware there are loitering issues wrapped up in that but given that there are plans to kind of redesign the building, I think some of those concerns will be addressed. … The "Moving Forward" initiative and all of the various projects that fall underneath that require funding. … When you have the ability to move from business to business easily and conveniently, that tends to foster economic growth. It's also a matter of perception as well because a city that's perceived to have a strong public transit infrastructure is perceived as a city to be reckoned with." Klitzke: "Yes and yes. I think the current location of our plaza, not only is it historically where it's always been, but it's kind of how our city developed. … Our city was meant to be serviced by transit. It was meant to be serviced by transit coming out of downtown; that's how it was designed, so it's a great opportunity to keep working with that. We already have a tight grid system with good densities for transit service in most of our existing city. We can thank the founders of our city the people who had the vision to do all this work between the 1890s and 1912. I would really not want to squander that opportunity that we've inherited to be a great big transit-oriented development like we were originally planned to be … The alternatives that have been chosen so far [in the "Moving Forward" plan] have been both ambitious and fiscally conservative enough that we should all be able to get behind them and support them, and this should be a great driver for the future of our economy." Stratton: "I support STA being downtown. I support the renovations that have been discussed as far as maybe bringing more to the plaza. It's so necessary that people in this community have a central place where they can catch a bus they can go downtown, they can take a transfer, they can get where they need to be, and I think that needs to be at a central location.… I think [the central city line] is a wonderful idea and I'd love to see it in this community. I always go back to in my mind when I think about these issues that, if people want certain services they have to pay for it and there's got to be a mechanism. … So, yes I would consider supporting something to help pay for that." What is your position on the upcoming street levy and park bond? Dominguez: "I actually support both of those. I think it's really important we maintain our infrastructure." Griffith: "I'm actually pretty excited by the levies and the bond … I definitely am in support of it. It hasn't really hurt me as a taxpayer in supporting it the last 10 years in that tax base. It's very minimal. ... The parks plan, I think that you're probably going to need to have more input from the citizens. From my perspective, it's been a little bit out there. I haven't been invited to participate, there hasn't been a lot of presentations to the public about what you want to accomplish with the park … I'm also in a region in the 3rd District where the parks aren't as supported. … I'd like to see this be a little bit more than just about Riverfront Park." Iannelli: "I am extremely supportive of both. ... When I just in casual conversation end up talking to people, the pot holes come up and the pot holes can't be fixed unless money is allocated to fix those pot holes. … I love the fact there's such a long term component built into this and that it doesn't raise the current rate of tax." Klitzke: "I think we really need to invest in [Riverfront Park] and make sure that we preserve that legacy that was left to us by all the work that was done in Expo 74. ... As far as the streets levy, I was a little concerned at first because our previous street bond only did curb-to-curb work and it left pedestrians, transit riders, folks in wheel chairs and the disabled on the sidelines … The narrative has significantly come along to where they're really embracing the complete streets concept and it sounds like they're planning for all users and so I'm very encouraged by that." Stratton: "I think they're both very important. I support both. I think it has been too long we have not put any money into Riverfront Park and yet it's the jewel of our city. … And the streets, absolutely. When you talk to people, public safety and streets are the first two issues that come up. 'I want to be safe in my neighborhood and when are you going to fix my street?' So, I would definitely support both and feel strongly enough that I would volunteer some time to help those issues along." What trends in Spokane would you like to support and what trends would you like to see reversed? Dominguez: "In our city limits one of the most disturbing facts that I have seen that I actually have identified is an 18-year gap of life expectancy between the most affluent and the poorest neighborhoods in Spokane County. Now that is a sad stat and we should all be angry about that. What we need to do is we need to start actually looking at the social factors in how they impact health outcomes. We can continue to throw money on the wall and see if it sticks, you can continue to develop programs and see if people get better, but people do not get better when we are not addressing those social factors that are impacting the decisions they are making ... I don't have anything off the top of my head as to what would be reversed, although I would certainly be open to people who have an opinion about what they think should be reversed." Griffith: "Trends I see that need more support … being a livable city. ... One of the things I've always felt was missing especially when I've lived in other cities and compared was the walkability or being able to bike. That's been a real issue for me. ... Things I wouldn't support that I haven't seen as much, unless you talk to some people from out of town sometimes, is the bashing that sometimes happens with Spokane [and] the in-fighting that I've seen with councils in the past. ... Spokane is evolving in a very positive way so I'd like to see that eliminated." Iannelli: "The trend in Spokane that deserve support, and I think this has kind of emerged in the Uber and Airbnb issues, [is] there is a new economy that is emerging alongside the traditional economy. … This is a trend that's actually happening kind of internationally and Spokane actually gets to benefit from it. It affords people greater flexibility. It leads to a different sort of economic growth and so this is something that I not only have a personal interest in but that I would like to support. I've also seen the arts community really come into being and come into its own and this is something I would like to support. … Trends that are worth [reversing]: the one thing I've noticed that is most concerning to me and I think we have already begun to address it at a grassroots level is the apathy, the disenchantment, the disaffection with the political process. One of the things that things that thrilled me about Spokane is the accessibility of the local government, but we had 35 percent turnout in the recent primary election. ... That suggests that between 60 and 70 percent of people are just completely disillusioned with politics as they see it. I think that's a perception issue." Klitzke: "The trends that deserve support are more people moving towards our city center and downtown. I think developments like Kendall yards and some of the newer condos that are happening are a great thing for our downtown. I think that our neighborhoods are starting to come out and have more character and neighborhood centers and activity. … I also am really enjoying the increased ridership in transit … I think we have a lot more people taking an interest in active forms of transportation and just walking and biking for transportation. … As far as trends I would like to see reversed, I think we continue to have problems with folks that are falling behind economically. I also think we're underserving folks with mental illness in our community." Stratton: "I think we're starting to look ahead [in] transportation, trollies, the central city line; I think that's a trend that is forward thinking for Spokane, that we're moving forward with more than just a bus system. I think the environmental issues that are coming into play moving forward protecting the river [deserve support]. I think we have a lot more respect for our environment now. … I think the trend of neighborhood business centers and promoting businesses and beautification in neighborhoods is a trend that is moving and I like that. … I think that in our doing business in the city whether it's in the neighborhoods, whether it's here in City Hall … I think that we tend sometimes to be a little bit too partisan." Why are you best for the job? Dominguez: "Right now presently I don't think anybody can analyze data like I can analyze data and, like I said, it's not simply looking at percentages and proportions, but it's actually making sense of that data to see if there is some type of correlation between an exposure and an outcome. I can bring that skill set to the council, being able to understand looking at data and using that data to make a decision on a policy. ... I'm of Mexican-American decent. I'm an ethnic minority. I don't see anybody on the council right now that represents the ethnic minority population in the city of Spokane. ... I think every individual in our city should be able to see themselves on our city council. They should be able to be represented and heard on the city council." Griffith: "In the district in which I reside, people tend to go, 'Hey, why are you living there? Why aren't you living on the South Hill? Why aren't you living in Liberty Lake? Why aren't you living in the Valley? … But I've lived in the same place for 20 years. I love my neighborhood. I would love it to be more vibrant than it has been in the past. ... Right now I focus on things at a national level. I work for a national nonprofit working to promote financial education. I think that I can take those same skills and abilities and focus at a city level to try to help people to improve their lives [and] improve their communities. I've proven to be able to do this across the board." Iannelli: "I think I bring a number of fairly unique life experiences and also a knowledge that I've cultivated from working with the neighborhoods. … So often legislation is a top down approach and I've been on the ground seeing the bottom up. … This international experience is something that you certainly can read about what other cities are doing, but [I] have that experience and I have a decade of living abroad where I was just an ordinary person living on the ground and I was able to familiarize myself with what those cities were doing." Klitzke: "I really think that I am a person who has accomplished things around policy and around efforts in this community, and I have a track record of getting things done. That goes beyond my day job and that goes beyond where I've worked in the past. As a volunteer and just as a citizen, I've worked hard to accomplish things on both on the policy side and the volunteer side. … While I think there's a lot of really smart and qualified people that have applied, I think that I have shown that I'm a hard worker and that I stick with things and that if things look tough, I don't back away." Stratton: "I kind of feel like my professional experience, my family background, has kind of led me to this. ... Politics is a really interesting environment. I think you have to have the skin for it, you have to have that bigger picture [view], … [and] you have to go into this with the best interests of the citizens. I think that I can — I know that I can do that, and I look forward to doing that. I think that since working in two mayors' offices and being an employee in two different departments, I kind of know how the sausage is made. … I really feel confident that I would be a really good councilmember."